For organisations with high intensity production schedules, cost driven decision making and thinly stretched maintenance budgets, shutdowns are viewed as one of the highest risk and intensity work programs in the annual calendar. Site personnel numbers can balloon, with multiple projects of varying complexity progressing in parallel, all under a singular work permitting, isolation system and HSE (health, safety, environment) department. In the pressure cooker environments of food processing, your organisation may only decommission one process line at a time, with significant maintenance or project works ongoing in the middle of live production. In this blog we outline the importance of forward planning your operations, knowing your shutdown costs and the value of the right personnel for the job. No time to plan? Find some! Allow approximately nine weeks of planning for every one week of shutdown work delivery. If your Christmas shutdown is going to be five days, have your team assembled and your shutdown manager convening the stakeholder kick-off meeting by early November. There is a lot of effort required to tender and procure the equipment and subcontractor packages, induct temporary personnel, negotiate with operations and marketing teams on recommissioning dates, plan the HAZOPs, draft the SOPs and more. Put simply, if you fail to plan, you are planning to fail. Shutdown planning and management is an art. Take the time to appreciate the importance of engaging a dedicated shutdown management team to work alongside, especially the manager. An efficient shutdown manager will be able to work across industries and apply suitably rigorous, risk mitigated master planning solutions to enable your operations to resume production inside the shutdown windows. 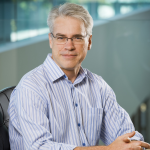 What is the value of an existing internal team managing shutdown? Have you sat down to analyse the value of this approach? Consider the potential risks of distracting the attention of your key team members, in order to save on headcount. A team member who is operating at or above 100% capacity cannot sustain workloads above this. Internal experts are most valuable as advisors inside shutdown teams, providing site, process and equipment expertise inside each shutdown job. Your team become the quality advisers inside the shutdown, as opposed to being consumed by the onerous duties involved in management and administration. What are the lost opportunity costs for shutdown events? The single most powerful metric you possess when it comes to shutdowns is knowing what one hour of production downtime costs your facility. If you knew your cost, would it change the way you plan your shutdown? Would you move to a compressed continuous 24 hour shut to recover production earlier, for example? Or defer non critical works until another time and refocus your energies elsewhere? An example of this is an organisation Wiley worked for who incur more than $200,000 cost for every lost hour of production. A few simple hours saved (or lost) can become very significant very quickly. Invest the time to collate and rank all of your upcoming works on a 36, 48 or 60 month horizon. Organisations that strategically extend their planning horizon will unearth amazing savings in both their CAPEX and OPEX budgets. Wiley have seen savings approaching 20% of project budgets due to long range master planning that challenges why and when your planned works need to be done. If you thought keeping a facility running was complex, try stopping one. 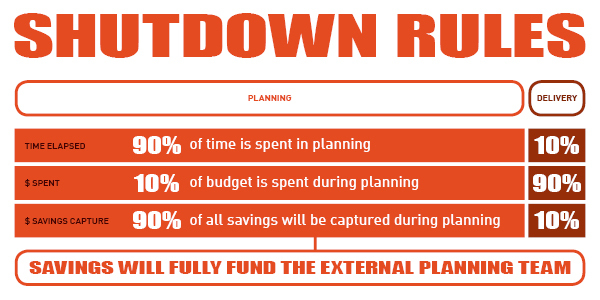 The diagram below demonstrates that for shutdowns, while the planning window is approximately ten times the length of the five-day delivery program (50 days vs five days), 90% of the budget is spent during those final days. While the 90% planning window you can see in the diagram above is a minor percentage of overall cost, it is when all of the savings are captured. A well planned shutdown can refund the cost of the planning effort. Wiley are often asked by our clients to undertake activities that could be self-performed, when the client simply does not have the time to ensure a quality outcome. The keys to a successful and efficient facility shutdown are in the planning stages. Choose your personnel wisely and seek advice. There’s no harder work than taking a break.